can’t afford to take shortcuts. 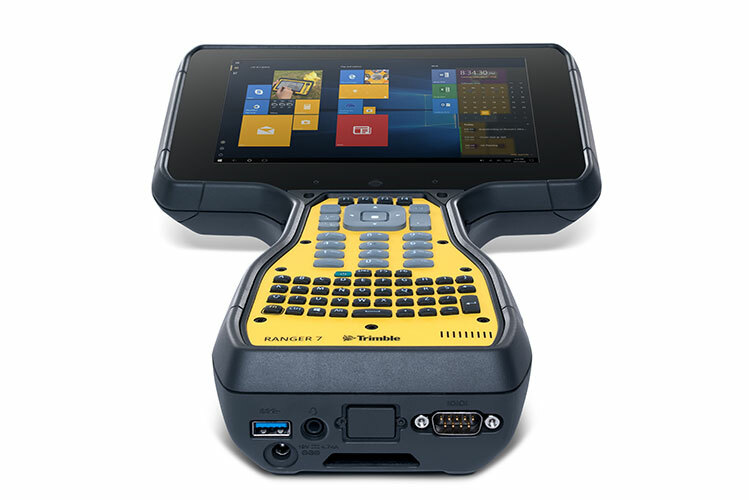 The Ranger 7 combines the scalable flexibility of Trimble EMPOWER technology module with a bold 7-inch handheld computer form factor, and the industry-leading Microsoft® Windows® 10 Pro OS, delivering a perfect combination of strength, smarts, and flexibility. This handheld is ideal for large scale field data capture in nearly any industry and application. Introducing Trimble EMPOWER: a modular expansion system that gives you the power to customize your mobile computing solution to your workflow, and the confidence of knowing that your investment is scalable for future needs. With Trimble EMPOWER-enabled modules, you can add specialist features such as high-accuracy GNSS, Barcode or RFID Asset tracking to your devices, or bring your own solution to life through the EMPOWER Developer program. The Developer program is accessible to both hardware and software developers, empowering anyone to create solutions that transform the way the world works. At seven inches, the Ranger 7’s highresolution Gorilla Glass display provides the perfect combination of size and robustness to survive the rigors of real-world use. The built-in 68-button keyboard allows for high data input and allows the entire screen to be utilized for application workflow. 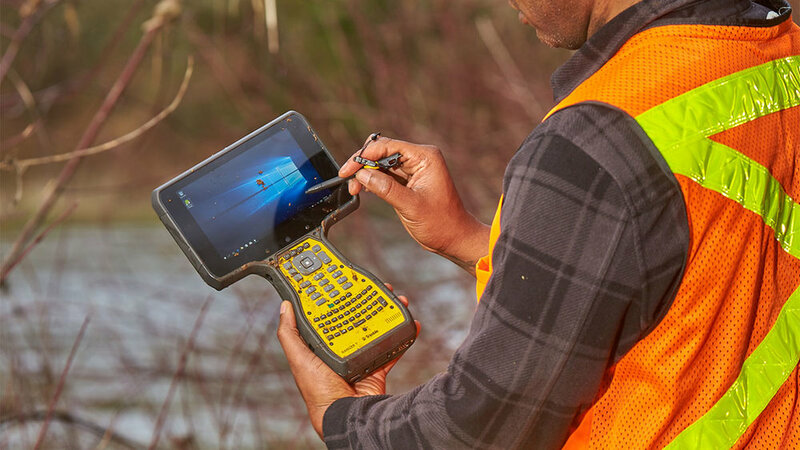 The Ranger 7 delivers powerful and dependable system capabilities, including 4G mobile data connectivity, wireless communications and broad peripheral support—enabling you to process more work faster and in more places than ever before. Ranger 7 is completely rugged, MIL STD-810G and IP65 & IP68- tested, and purpose built to perform in almost any environment—hot or cold, wet or dry. The Ranger 7 runs Windows 10 Pro, the industry leading professional operating system for businesses. Now you can move seamlessly from field to office by running both field and office applications on a single device. With the Windows 10 Pro enterprise grade security capabilities, the Ranger 7 can be integrated seamlessly with your IT infrastructure, no matter how large (or small) your organisation. Investing in equipment that is destined for years of outdoor operation demands quality that you can trust, comprehensive technical support when it is needed, and professional service and maintenance coverage should something go wrong. Trimble stands by the quality of our products with a full two-year factory warranty, with options to extend that coverage to up to a total of five years. Alphanumeric QWERTY keyboard, including 12 application programmable buttons to improve efficiency in your daily tasks. Ranger 7 rugged handheld offers optional modules (Barcode, RFID and GNSS) PLUS a Developer program to enable quick prototyping of your own custom modules. 4G LTE mobile data, WiFi and Bluetooth. Reliable highspeed wireless connectivity on the go, when and where you need it. Compatibility with your existing workflows and IT infrastructure, and enterprise level security capabilities you can trust. Keypad: 68‑key alpha-numeric keypad with 4-way directional pad, Enter, F1/F2/F3/F4/F5/F6, and Windows function key. Dual, Li-Ion hot-swappable field replaceable battery packs. Capacity: 7.2 V. (21 Wh) each.